Because this manufacturer allows only limited online advertisement we are not posting the brand name and model numbers. Please email us or call us at 1 888 205 7766 to receive our PDF file brochure and installation instructions. Geothermal heating relies on a heating technology that utilizes the earth as the primary source of energy thanks to the relatively stable temperature 4 to 6 feet under the ground. (Unlike the outside temperature that keeps changing according to the season) This makes it a very eco-friendly method of heating and cooling that can be 7X more efficient than other methods. The way that geothermal heat pumps work is that it extracts solar energy trapped in the earth and transfers it into the body of water that you wish to be kept warm. In addition, the system usually consists of an underground network of pipes known as earth loops or geothermal loops to gather the heat energy. Hydronic geothermal heat pumps, also known as water-to-water heat pumps, are a form typically used for water heating. Nearby lakes, ponds, wells or oceans are used as the energy source for heating the swimming pools. This method has proven to be efficient as well as being economically and environmentally friendly. Twisted titanium source water heat exchanger. Full 5 year parts & 2 years labor on the heat exchanger, no exclusions. Digital Pool & Spa thermostat. Hi Temperature Limit lock out feature . Durable & maintenance free. Copeland scroll compressor. Powder coated aluminum cabinet . For strength & longevity. Highly efficient & quiet operation. Performance tested to meet BTU’s & COP’s listed by E.T.L. 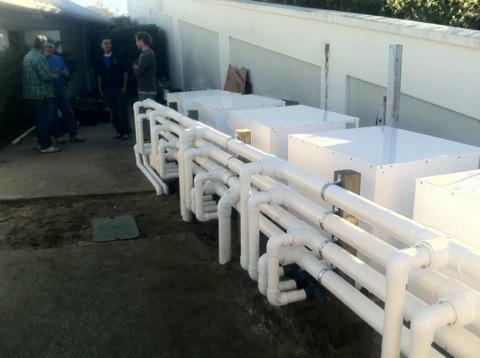 Another successful geothermal installation performed in a commercial swimming pool. For a residential pool you might need only one unit with the same results. We are here to help you if you have any questions about our geothermal pool heating units. We had been working with geothermal technology since 1982 and we are always happy to help in any way. This is geothermal pool heat alternative that is affordable and easy to install.